Twice voted “Happiest place to live in the UK”, Harrogate’s charming, laid-back nature offers a true North Yorkshire welcome. 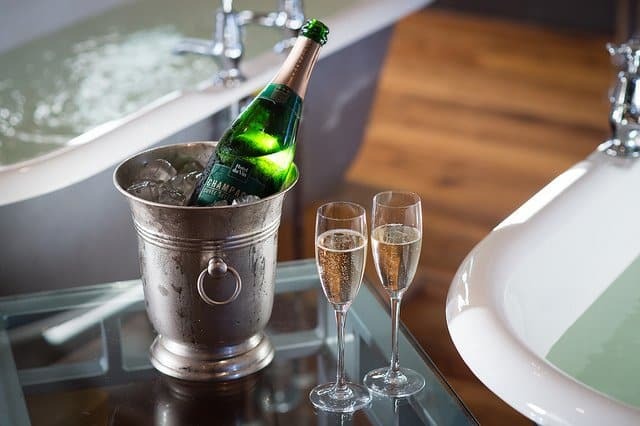 What better base to explore its unique atmosphere and distinctive character than the Hotel du Vin, the most luxurious of dog-friendly hotels in Harrogate. Harrogate itself brims with charm. A delightful mix of elegant tree-lined avenues, attractive period architecture, quirky independent shops, cobbled streets, chic bars, restaurants and cafés – and of course, Yorkshire’s famous teashops. What’s more, it’s not just the Hotel Du Vin that welcomes dogs, lots of places in Harrogate are also dog friendly. Stay in one of our 48 rooms and suites and enjoy the luxury of a huge custom-made bed with hand-sprung mattress, soft Egyptian bed linen, fluffy towels and robes, and a monsoon shower or deep roll top bath. Outside, the classic period features reflect the Hotel du Vin style and relaxed ambience inside. Relax in the walled courtyard and soak up the tranquility while enjoying an aperitif, cocktail, or glass of fizz in the elegant, informal pewter top bar. Whilst your here, why not treat yourself to a spot of pampering at the Spa du Vin and make your stay with us truly memorable.